In biological taxonomy, a domain (also superregnum, superkingdom, or empire) is a taxon in the highest rank of organisms, higher than a kingdom. The 'two-empire' system, with top-level groupings of Prokaryota (or Monera) and Eukaryota empires. The six-kingdom system with top-level groupings of Protista, Archaebacteria, Eubacteria, Fungi, Plantae, and Animalia. The three-domain system of Carl Woese, introduced in 1990, with top-level groupings of Archaea, Bacteria, and Eukaryota domains. After defining Archaea as a new domain, Woese redrew the taxonomic tree. His three-domain system is based upon genetic relationships. 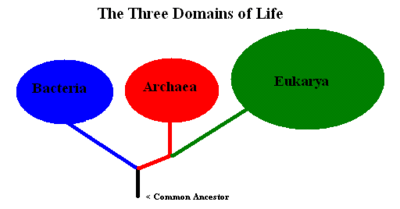 It divides life into 23 main divisions in three domains: Bacteria, Archaea, and Eukarya. Archaea are neither bacteria nor eukaryotes. Looked at another way, they are prokaryotes that are not bacteria. The three-domains tree and the Eocyte hypothesis (Two domains tree). Domain (biology) Facts for Kids. Kiddle Encyclopedia.